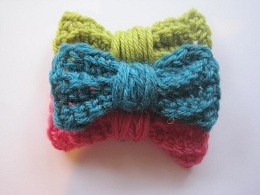 This bow is super simple, super cute and super versatile. Sew it onto a blanket, a beanie, a purse or a headband for an extra bit of girly or add it to a hair clip for an adorable hair accessory. Border: do not turn, sc in along side of each row, in each ch across bottom, and along other side of each row. Wrap yarn around center of bow until center looks right to you. I like big fat centers, so I wrapped it around tightly at first and then loosely around 30-35 times. Tie knot in back of center bump. Finish off. Now weave in all the ends, make it pretty! This entry was posted on Wednesday, November 24th, 2010 at 1:06 AM by Erin Burger	and is filed under Free Crochet Patterns. You can follow any responses to this entry through the RSS 2.0 feed. You can leave a response, or trackback from your own site. These bows are really nice. My granddaughter loves hair things so I may try to make some for her. Wow, this is so pretty! And easy, to boot. 😀 Thanks for the pattern, Erin. Thanks so much for your free patterns! I love the way you write patterns, they are so easy to follow and they always come out cute! ADORABLE! I’m going to have to make some for my baby girl! Rachel — Love the bows and perfect timing for holiday gift wrapping ideas. Thank you for this cute and easy pattern. 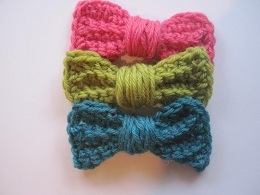 We can use these bows on teddy bears that a friend and I are crocheting for children in Africa. These are great! They’ll be easy to make up a whole bunch for stocking stuffers! Thanks yet again for another wonderful inspiration! Thank you ~ made these and they turned out really nice. Great emblishment bows. Love them. That is too cute 🙂 Very Simple. Might make some tonight for church for my girls..
Hi Rachel! Thanks! 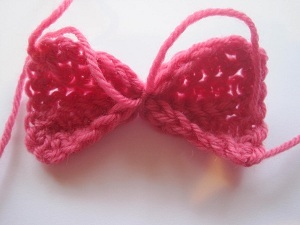 I made these and I love how these bows look:) I posted them on my blog and linked back here. Have a great day. Love it! Perfect for my owl hat. Loaded pix on Ravelry. Ok, order to save space, time, and my fingers, I’d like to say OMG these bows and pretty much every free pattern here is now in my ‘patterns to print’ folder on my desktop!! Please keep up the fab work you all do. Thanks for the free pattern. I’ll add this to my list of last minute gifts for ‘surprise’ parties..that is the ones your child forgets to tell you about till the last minute! Hair accessories for girls seem to be back in vogue and the more different to everyone else’s the better. Lol, around here homemade is ‘in’ at the moment! Can you tell me the best type of yarn to use for these? I’ve used 100% cotton and they just don’t lay well. No matter how loosely I crochet, the edges like to curl up! This pattern is awesome! I dont know how to crochet very well so I will show this to my cousin to make for me! 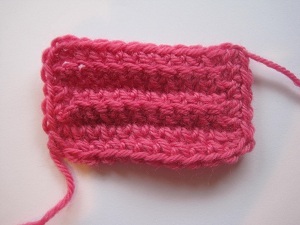 Question…After the “Finish Off’ step, did you cut the yarn leaving several inches to wrap around? Or do you not cut the yarn until you”re done wrapping? I’m a children’s librarian and I plan on making these for the preschool girls who come to Story Time. Thanks for the pattern!! Hi Heather, when you finish off you cut the yarn. The yarn that’s left on the side of the piece isn’t the yarn that you’ll be wrapping around the center. To make the center of the bow, you’re going to tie a new strand of yarn around the center of the bow, then wrap it around. I am trying to make this and I am having little success in making it with SC. Is it possible that I should be using a DC? Hi Marla, you can try doing it in dc if you want. I’m not sure why the sc version isn’t working for you. Maybe you can explain the problem a little further and I can try to help. Hi, I just want to thank you for this great pattern. I used it several times on children’s hats and it looks so cute! It’s also very easy and quick to crochet. Working in the back loops is something that I never tried and now I SEE how nice it looks… kind of like steps. Thanks again!